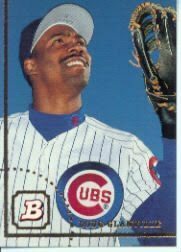 I love listening to Doug Glanville talk about baseball. His writing sparkles, too. In 2008, he wrote an apology of sorts for all his unanswered fan letters through the years. The column, first appearing in the New York Times, can be read here from Doug’s fascinating website. For everyone who’s grumbled, “He switched my card” or “He kept one,” this is proof that players are human. Glanville didn’t talk about getting secretarial help from his teams to keep mail sorted and answered. I like his essay, too, because you get a feel for what kind of letters mattered most to him. In an update to Glanville’s efforts to get his fan mail under control, I checked the always-helpful http://www.sportscollectors.net/. I think collectors got scared away from writing Glanville after he admitted in print that he hadn’t answered every letter. Collectors had a 53 percent success rate through the mail with the center fielder. Sure enough, he’s taken more than 1,000 days to answer several letters. Twenty-eight years later, my wife and I still hear from people muttering that our thank-you notes were sent to the wrong people. We confused a couple of the gifts with the givers. To deal with hundreds of cards a year belonging to various strangers? Eeek! 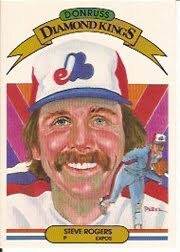 Expos Pitching Legend Steve Rogers, Be a Diamond King Again! These days, Rogers works at the Players Association. He’s special assistant to Michael Weiner in charge of player pension issues. He could add one more victory to his history page, advocating for the 874 fellow players who deserve pensions. Steve Rogers was the alter ego of comic book superhero “Captain America.” This Rogers can be a super hero again, too. “Strictly speaking, there is no online list to see who is getting hosed and, as you can well imagine, the union was less than forthcoming whenever I tried to make contact with them. (Frankly, they guard the names of the 30 player reps so tightly, you’d think they were guarding the secret formula of Coca Cola, which is stored in a vault in the main headquarters of Sun Trust Bank in Atlanta). Since they were less than cooperative when I was doing my research, I had to use that great online resource, http://www.baseball-almanac.com/, to figure out who was getting shafted. Lastly, here’s a non-autograph reason to write to players. The player union keeps the names of team representatives quiet. If you spot a player mentioned in print, such as “Cardinals player representative Kyle McClellan,” make a note. These players have special powers. When the next contract between teams and the player union takes places in 2011, the pension-less 874 needs to be negotiated. All players need to know that they shouldn’t forget those who came before. Share it with other fans, collectors, media — anyone who’ll listen. I’ve yet to receive a ransom note from one of the 874 saying, “Baseball has robbed me of a pension, so I’m punishing autograph collectors by demanding $$$ per signature.” These are fellow fans: good, deserving men who want to keep their love for baseball. If the crowd roars, MLB has to listen. 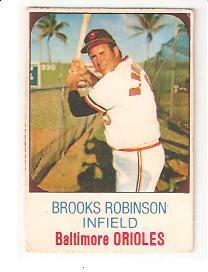 In 1975, Brooks Robinson basked in the twilight glow of a sterling career. 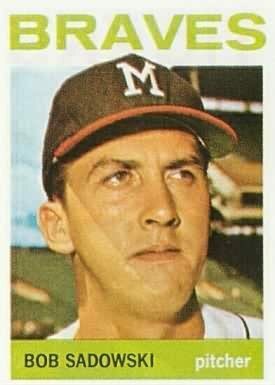 Meanwhile, teammate Baltimore teammate Jim Hutto struggled for a second chance after his debut with the 1970 Phillies. Five more seasons of minor league exile followed. Please, go the Doug Gladstone’s website to learn more about this wrong. Buy his book if you can. Then, get ready to go to bat for 874 deserving players. Good letters can do more than obtain autographs. Good letters can change lives. Tomorrow: the author tells all, giving a list of the people and places fans can contact with their protests. Gladstone focuses on the “gap” players, those who retired without having logged the then-required four seasons of service to qualify for a pension. Despite a new contract in 1980 that makes players from that year forward “vested” (pension eligible) after just 43 days on a Major League roster, and just ONE DAY to qualify for medical insurance, the agreement was not retroactive. The original pre-1980 group of 874 still get no monthly payment. Sadowski is among the ignored, those who want the pension both for support, and for a validation from MLB that their efforts mattered. Author Gladstone’s stories are both shocking yet uplifting. Shocking in that baseball has turned its back on too many players who gave their hearts to the game. Nonetheless, these former players still feel a grateful obligation to fans and collectors. They know that neither group was responsible for depriving them of a pension. That’s enough to make outraged fans stand up and cheer for these forgotten men. Gladstone has done more than write a book. He’s trying to right a wrong while bettering lives. Check out his website for more examples of how his book could help restore the game’s conscience. Tomorrow: learn of a former teammate’s letter to Brooks Robinson, a plea still awaiting a response. 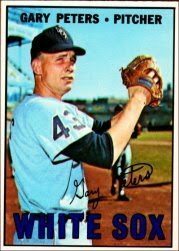 Pitcher Gary Peters Strikes Me Out! Imagine going to bat against an all-star. Strike three! Wait…someone’s calling from the mound, apologizing and thanking the batter for the out. That mannerly moundsman might be Gary Peters, a two-time All-Star who led the American League in wins in 1964. “I don’t do questionnaires! Sorry. For the record, I don’t send a fill-in-the-blank worksheet. My personalized letter includes three questions. Nevertheless, Peters included an autographed card of his own to lessen the agony of defeat, along with his autographed note of regret. 1. RTS. “Return to Sender.” The addressee wants no part of your envelope. 2. Blankedy-blank. Your letter and card come back in your SASE. No signature. No explanation. The lack of ink makes you feel like saying the above — unbleeped version. I’d choose Gary Peters every time.